rice and drinks if you’re not up to the challenge of spicy food. more complex and layered than that. delicate flavour to it thanks to the freshly shredded crab meat. (and pain) to this reviewer’s eye. next-day-leftover test when it tasted just as great when reheated. dessert; even though their menu of fruit dishes and assorted puddings seemed tempting. your date as well as your business partner. Order rice if you're a wuss. 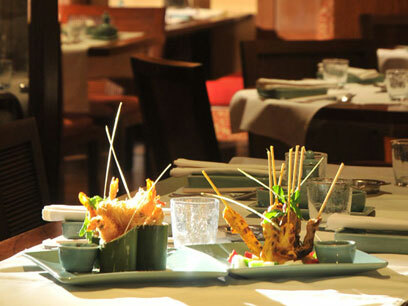 Spicy Thai cuisine with interesting combinations of flavours in an elegant and sedated atmosphere. Mild food is definitely not mild. And the lemon juice with mint was pretty disappointing.